•General purposes for indoor applications that require impact protection. •Provides 99% protection from harmful UV-A and UV-B rays. 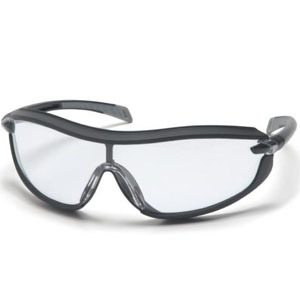 •Sports-look safety Spectacle with superior eye protection. •Unique temple design with co-injection temple tips for cushioned comfort. •Open temples allow clip on cord option for goggle-like fit. •Soft foam padding provides comfort fit.